Technically, it’s not a heart, nor a platter. 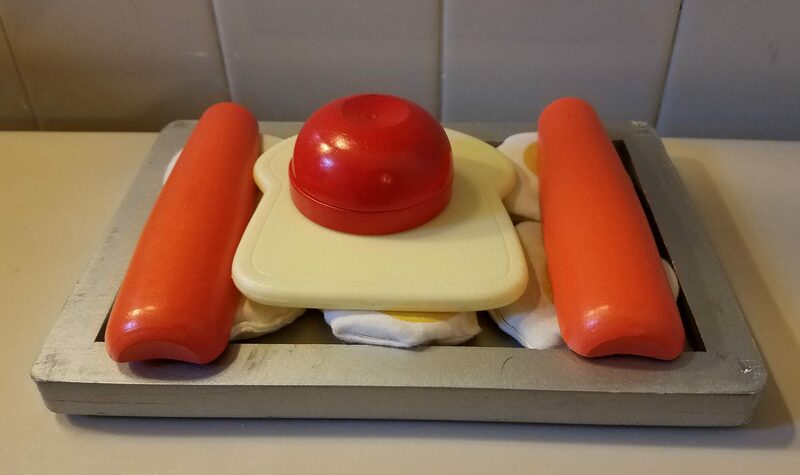 No, that’s a wood cookie tray holding a wood tomato that’s stacked on a plastic slice of bread, flanked by wood carrot halves, all resting on a bed of bean-bag egg yolks. Sweetie told me, “I want to leave this here for Mommy, for when she gets home.” Like an offering. Or a sculpture to profess her adoration. This became one of those balancing moments as I gently suggested she return the tray to the play kitchen, located on the opposite end of the apartment. Practically speaking, I didn’t want toys stacked all around the narrow entrance way. But I didn’t want to brush off her totem and hurt her little feelings. And this is life with a four year-old child. They are old enough to show emotional development and express it creatively, but they are limited by the narrow scope of their life experiences and the resources that they have to work with. I mean, you can only say so much with Play-Doh. Or in this case, play food. So it becomes a balance of fostering their development while guiding their actions, the whole time trying not to crush their budding aspirations. Wow, that looks like a summary of parenting in general. Our resolution was to put the tray on Wife’s pillow. There, win-win. Sweetie put her creation in a place of honor for Wife, and I kept my walkway clear of clutter. She felt loved and supported, and I chalked up another note of parenting wisdom. Wood tomatoes for everyone. This entry was posted in Pink Sock Journal and tagged chicago, child behavior, Pre-school life, SAHD, Stay-at-home Dad. Bookmark the permalink. Awwww! That’s the best. How nice for Wife to discover she is thought of during the day while she is at work. And such a well balanced meal!